Shredded lettuce below the hand-shaped patty. After a surprising number of attempts met with failure, some friends of mine and I finally made it into Bill’s Bar & Burger in Rockefeller Center. We had previously failed because the lines were atrocious (not too surprising, given the location), but it turns out the perfect time to go is a bitterly cold winter day. No line. 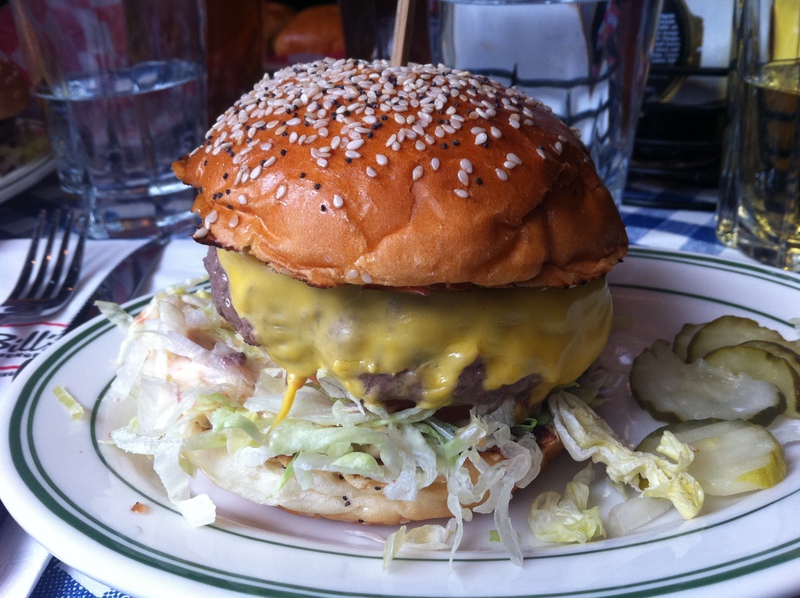 I’m a huge burger buff and was ready to sample the fare at Bill’s. I should point out, before we get to the goods, that they have a pretty extensive beer list that I should like to explore at some point. But for now, let’s focus on the chow. For $6.95, you can get their standard 5 ounce patty. For $8.95, they’ll make a hand-shaped 8 ouncer. I went for the jumbo. However, it has some design flaws. See how they put the shredded lettuce underneath it? Notice all the juices? That will come to be a bit of a problem later. But first, how about the flavor? Guess what? It was surprisingly good. It has that close-to-the-bone flavor I adore. The cheese is also surprisingly present in the flavor, though I have a hunch it is punched up by the sauce (which has a mayo base). The pickle flavor is also surprisingly present and strong. All in all, the flavor was like a more adult, satisfying, less sweet version of McDonald’s. As a person who has missed that flavor (since I haven’t eaten there in years), it was nice to chomp into again. I do not want to do any injustice to Bill’s, though: the beefy meatiness is very satisfying, the cheese strong, the sauce and pickles rounding out the experience. 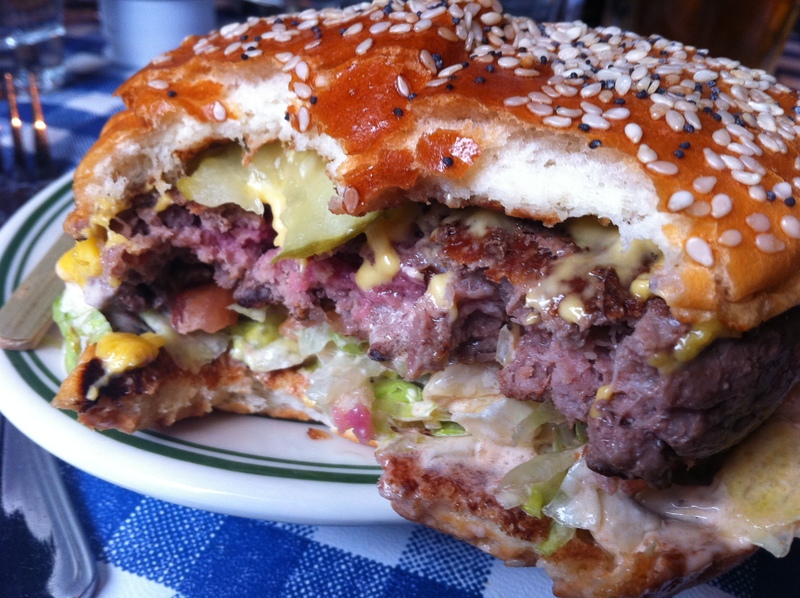 The heftier, hand-made Bill's Burger. My biggest complaint though is that the Bill’s sauce is amazingly runny. Between the juiciness (which is great), the Bill’s sauce and the shredded lettuce, it’s almost as though the burger is topped with cole slaw. That can make it very drippy and hard to handle. 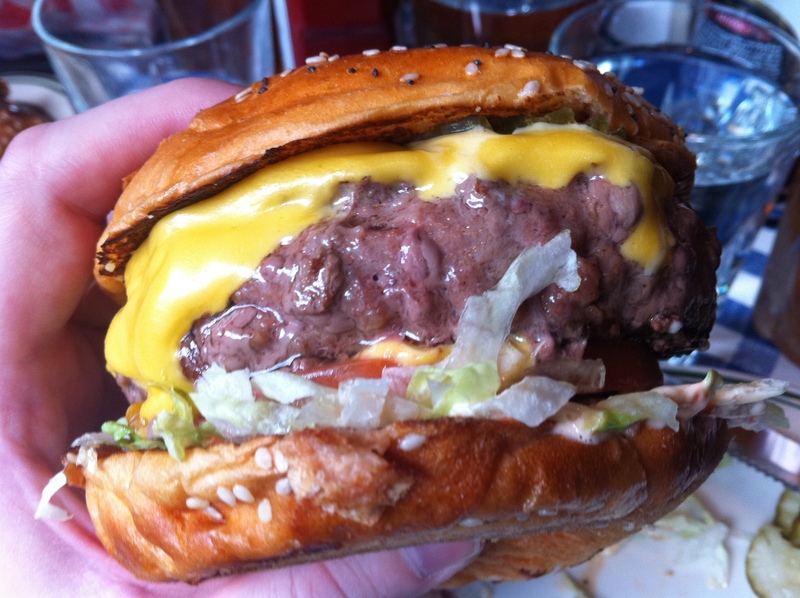 Notice though that my medium-rare burger came out just right. The onion rings looked lame but were surprisingly good. 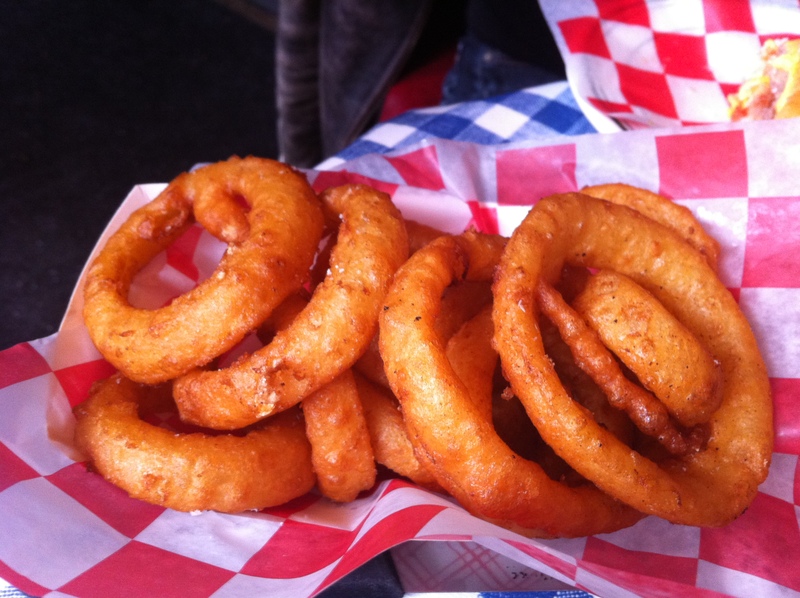 The onion rings were also surprisingly good, despite their threatening “fresh from the grocer’s freezer” look. The beer battering was crunchy and rich. All in all, the meal was surprisingly good. I’ll definitely be back to give it another run.